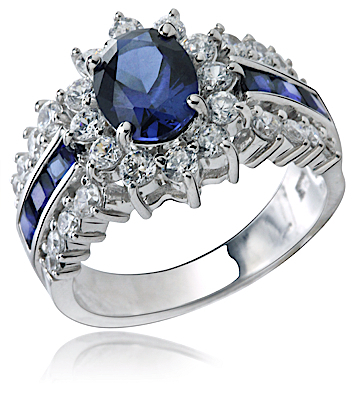 The Regent Oval Man Made Sapphire Cluster Cubic Zirconia Halo Engagement Ring features an oval center stone highlighted by a halo of prong set diamond look rounds. 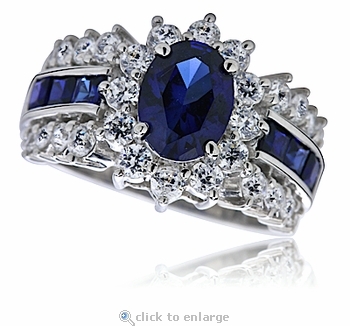 The shank of this ring includes channel set princess cut squares set between additional prong set round cubic zirconia. The Regent Oval Cluster Cubic Zirconia Halo Engagement Ring is pictured with a man made sapphire stones for a rich and regal look. The Regent Oval Cluster Cubic Zirconia Halo Engagement Ring includes over 4 carats in total carat weight of the finest hand cut and hand polished original Russian formula diamond quality cubic zirconia and measures approximately 6.5mm in width. For further assistance, please contact us directly at 1-866-942-6663 or visit us via live chat and speak with a knowledgeable representative. Due to extremely low pricing, all clearance sales are final. Sizes below a 5 or above an 8 can be made via Special Order. Please call 1-866-ZIAMOND for a quote.